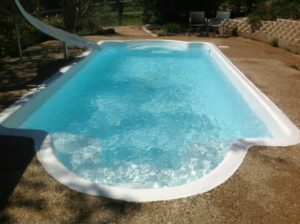 Texas Fiberglass Pools Inc. is your source for El Paso fiberglass pool repair, pool, spa, and fountain resurfacing in Fort Bliss, Socorro, or anywhere in El Paso County. Our swimming pool repair contractor will provide a free estimate and complete the work efficiently and in a timely manner. This will allow you to continue to enjoy your pool or spa without having to worry about guests noticing those unsightly blemishes, or worry about having to spend thousands of dollars to replace your pool or spa. We have experience with all types of pools, and can repair tiles and copings. If your spa or swimming pool needs repairs or maintenance to the plumbing, we can provide the same quick and efficient service at a reasonable cost. We are also your source if you need to repair or an upgrade to your deck or patio, even if you do not have a swimming pool or spa. Texas Fiberglass Pools Inc. can install and resurface fountains, hot tubs and baptisteries. We will provide maintenance on these amenities to ensure that you can enjoy them for many years without having to spend more money than necessary. We will not tell you that your job is too big for us to handle, or tell you that it is too small to be worthwhile; we provide fiberglass resurfacing services on any sized pool, spa, fountain, or baptistery. Contact us today to discuss how we can help you with your plans to improve or install your outdoor amenities. One of our most favored ways to bring a natural yet sophisticated style to our El Paso residents’ poolside retreats is with a custom flagstone patio and walkway. A flagstone walkway or patio is a relatively inexpensive and easy-to-install option for creating décor and functionality to any outdoor living space. Flagstone can be surrounded by landscaping such as grass, flowers, or small decorative rocks to enhance your personal outdoor environment. Any of these options can lend a very unique touch to your walkway. We install El Paso flagstone walkways and flagstone patios on both residential and commercial properties.